update properties of Active Directory object using modification templates, etc. With Adaxes you can quickly and easily automate such tasks, and you don&apos;t need to be a software developer to do this! Scheduled Tasks is a very powerful feature for Active Directory automation that enables you to schedule the execution of practically any operation on Active Directory objects. A Scheduled Task periodically performs a predefined set of actions on each object included in the activity scope of the task. For example, a task that applies to user objects can be executed for all users in a domain, for members of specific groups, for users located in specific Organizational Units, for individual users, etc. If necessary, you can exclude specific users, groups and OUs from the scope of activity of the task. With the help of conditions, you can control whether certain actions must be performed on a particular Active Directory object. 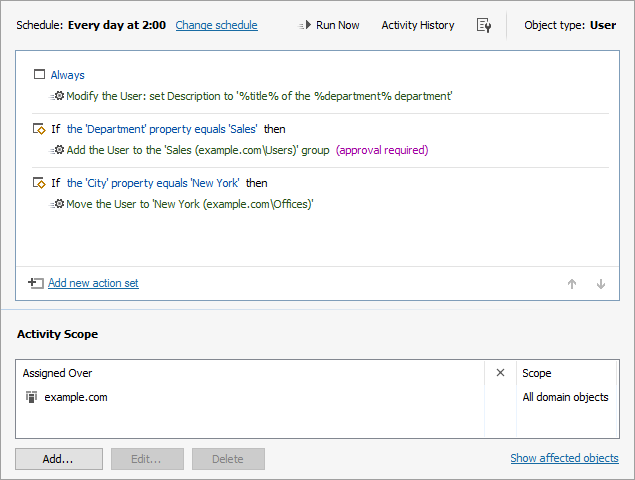 On how to create Scheduled Tasks, see Schedule Tasks for Active Directory Management. When it comes to Active Directory automation, you will often want to control the execution of some critical operations, like deleting inactive accounts or adding/removing users from security groups. 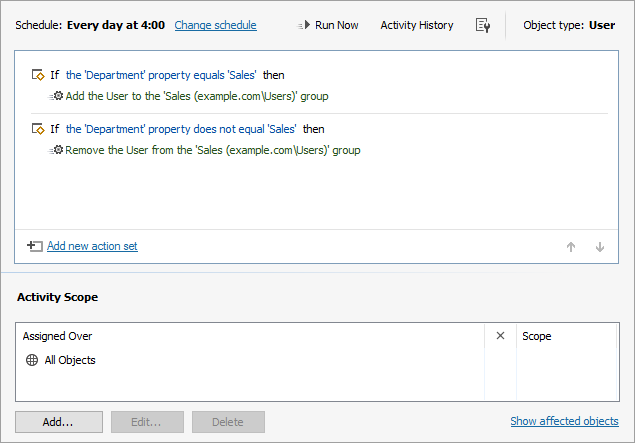 A great feature of Scheduled Tasks is the ability to control their execution by submitting specific task actions for approval. Actions that require approval will not be executed until approved by a person in charge. Adaxes sends e-mail notifications to all authorized approvers once an operation is submitted. To monitor operations performed by a Scheduled Task, Adaxes provides you with great reporting capabilities. 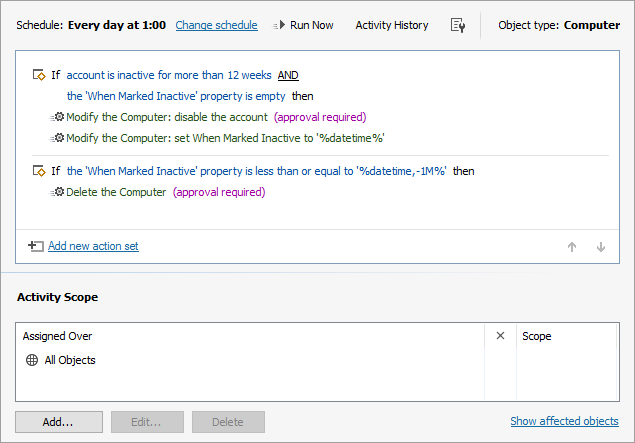 With the help of the Activity History view, you can find out what actions have been carried out by the task, when, on what objects, etc. For users, passwords always expire unexpectedly. This often results in an increased number of Help Desk calls and losses in productivity. This is not a problem if a user logs on to Windows interactively (via Ctrl + Alt + Del), as Windows notifies users when their passwords are about to expire. However, if a user account is used only for VPN connections, accessing file shares or working with web applications like Outlook Web Access, users are not notified about password expiration, and as a result, forget to change their passwords in time. With the help of the built-in Scheduled Task called Password Expiration Notifier, you can easily automate sending of email or SMS notifications to inform users about password expiration in advance. All you need to do is enable the Password Expiration Notifier task. To change their passwords, users can use Adaxes Active Directory Web Interface. Sometimes it is important to notify the account owner and his/her manager about expiration of the account. 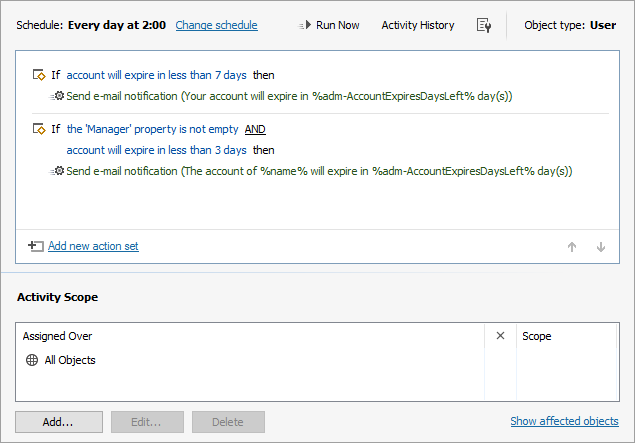 With the help of the Account Expiration Notifier task, you can easily enable automated sending of account expiration notifications to users and their managers. 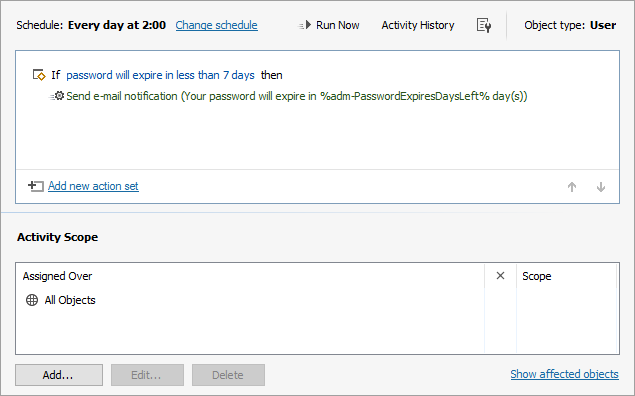 To start sending account expiration notifications, just enable the Account Expiration Notifier task. Keeping Active Directory clean of unused computer accounts is very important. However this can be a tedious process as it is difficult to distinguish inactive computers from computers used occasionally, or computers that have not been rebooted for a long time. The Inactive Computer Deleter task helps you automatically purge inactive computer accounts from Active Directory. To identify unused computers, the task uses a complex algorithm that takes into account a lot of factors. If a computer is inactive for a certain period of time, the Inactive Computer Deleter task submits a request to disable this account and marks this computer as inactive. If the computer is not enabled during some time after it was marked as inactive, the task submits a request to delete this computer account. The computer is deleted only after the operation is approved by an authorized person. For more details, see Delete Inactive Computers from Active Directory. Active Directory may contain a lot of user accounts that are not required any longer, e.g. accounts of terminated employees, expired accounts of external subcontractors, etc. It is very important to periodically purge Active Directory from such dormant accounts. It is highly NOT recommended to delete terminated user accounts from Active Directory. Instead, user accounts must be properly deprovisioned. For example, you may need to forward all incoming emails of the terminated employee to the his/her manager, move the user's home directory to a new location, hide the user's mailbox from Exchange address lists, disable the user for Lync, etc. To introduce strong and reliable mechanism for deprovisioning of inactive user accounts, Adaxes provides a built-in Scheduled Tasks called Inactive User Deleter. If a user account is inactive during a certain period of time, the Inactive User Deleter task submits a request to execute the built-in Custom Command called Deprovision for this account. You configure this Custom Command to execute deprovisioning operations specific to your environment. After a certain period of time, the Inactive User Deleter task submits a request to delete the deprovisioned user account. The user account is not deleted, until the operation is approved by a responsible person. For more details, see Automatically Deprovision Inactive AD Users. 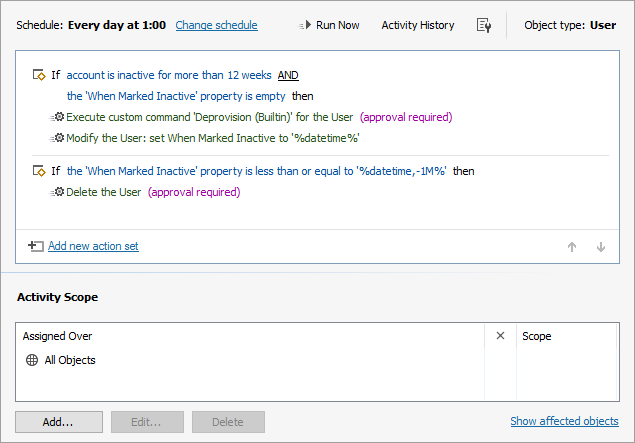 Along with Scheduled Tasks, Adaxes offers other helpful features for effective Active Directory management that allow you to automate user provisioning and deprovisioning, securely delegate rights using the Role-Based Access Control model, ensure the uniformity and validity of data in Active Directory, and much more.